When placing porcelain veneers, we will typically use our dental laboratory to create a mock-up so that you can visualise what your teeth may look like following treatment with veneers. Once you are happy, we will proceed. As they are made from porcelain in the laboratory, it is possible to tailor-make their shapes and colours to get a perfect aesthetic outcome. They can be a quicker alternative to minor orthodontic work where there is minimal crowding or irregularity in the alignment of our teeth. Additionally, they are stain resistant, so they do not discolour over time. 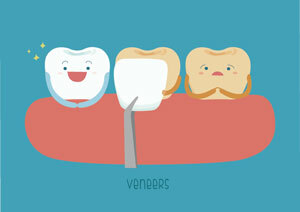 With the correct maintenance, veneers are very durable and can last for many years. What Can I Expect With My Veneers? It typically takes about two weeks to get used to the shape and feel of your “new” teeth. It’s not unusual to experience some sensitivity to heat and cold during this time. Veneers can last for many years provided you care for them properly and avoid biting on hard objects (such as ice cubes and carrots), chewing your nails, or using them to open objects. It’s also essential to maintain proper daily dental hygiene and visit our office twice yearly for regular cleanings and examinations. Doing so can help to ensure that your veneers are shining like new, with no cracks or other visible defects that may need to be addressed. If you’d like to see if veneers may be right to meet your smile needs, we invite you to schedule a free consultation at Willeri Dental in Parkwood!